Also last night, how’s this for combining my interests of transport and classic video gaming? 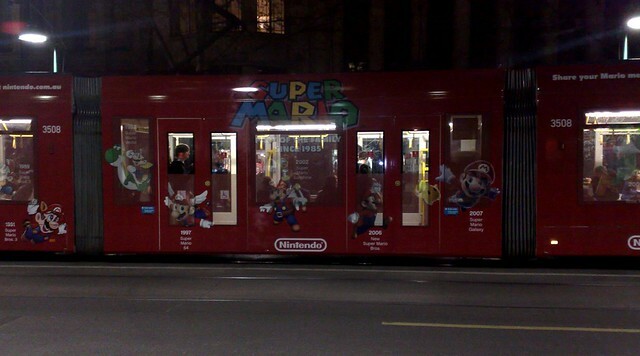 The Super Mario tram — celebrating 25 years of Mario games. ← Previous Previous post: What ever happened to…? Super Mario 64 on the Nintendo 64 is still my favourite Video Game of all time. Should probably run on route 64 I reckon. According to Tram Tracker it’s currently on route number 16. Shame Nintendo have completely dumbed down their entire gaming experience though. I used to own a Wii and got rid of it due to the sheer amount of abysmal games that came out and hardware limitations. I’ve seen the same thing on buses.